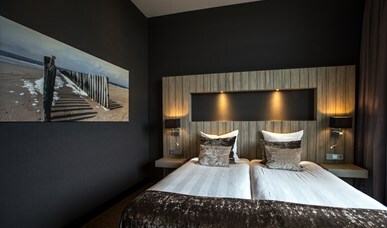 Our comfortable room is equipped with two single beds (length 2.10m), desk, seating area, wardrobe and a spacious bathroom with bath and walk-in shower. The toilet is separate. Furthermore, the room offers a safe, flat screen TV, refrigerator, climate control, coffee and tea making facilities and French balcony. 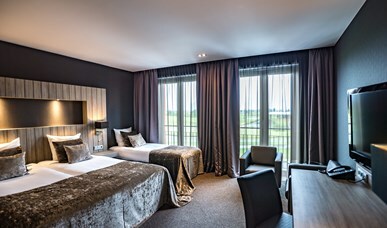 The hotel has 6 standard rooms which have two comfortable single beds (length 2.10m) for a good night’s sleep. The bathroom has a shower and/or bath and a toilet. A comfort room but with an extra bed, also 2.10m long. The hotel has 8 triple rooms. The spacious bathroom has a bathtub and walk-in shower. There is a separate toilet next to the bathroom. There are 4 family rooms in the hotel. They are almost identical to the comfort rooms but have a separate bedroom for the children. The spacious bathroom has a bathtub and walk-in shower. There is a separate toilet next to the bathroom. 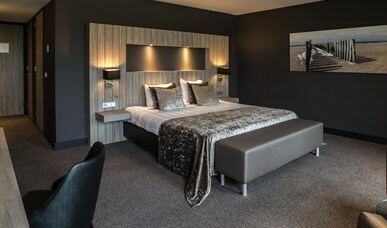 Luxurious room with a double bed and a spacious seating area. The bathroom has a double sink, hot tub with flat-screen TV and walk-in shower. There is a separate toilet next to the bathroom.